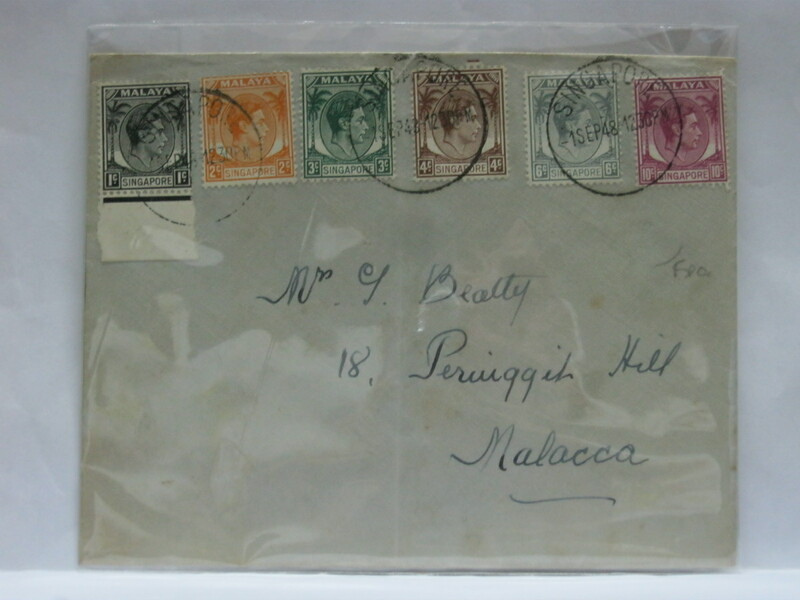 Here are some of my collection from Malaya. 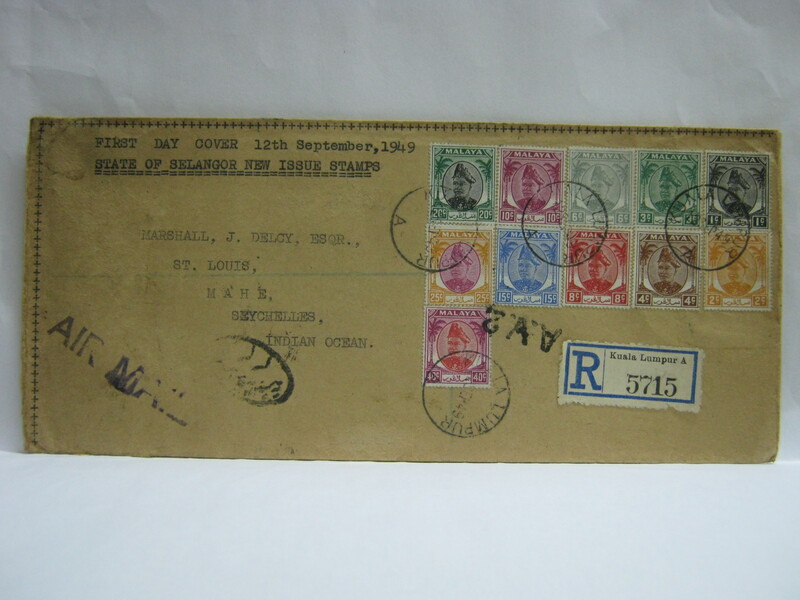 It is quite hard to find FDCs let alone concordant cancellations in this era. 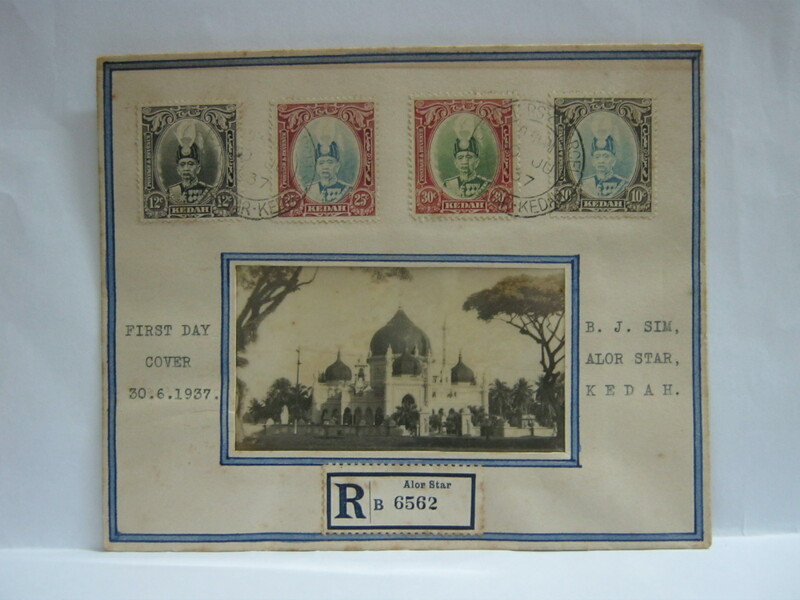 This FDC was cancelled in Alor Setar and sent via registered mail. 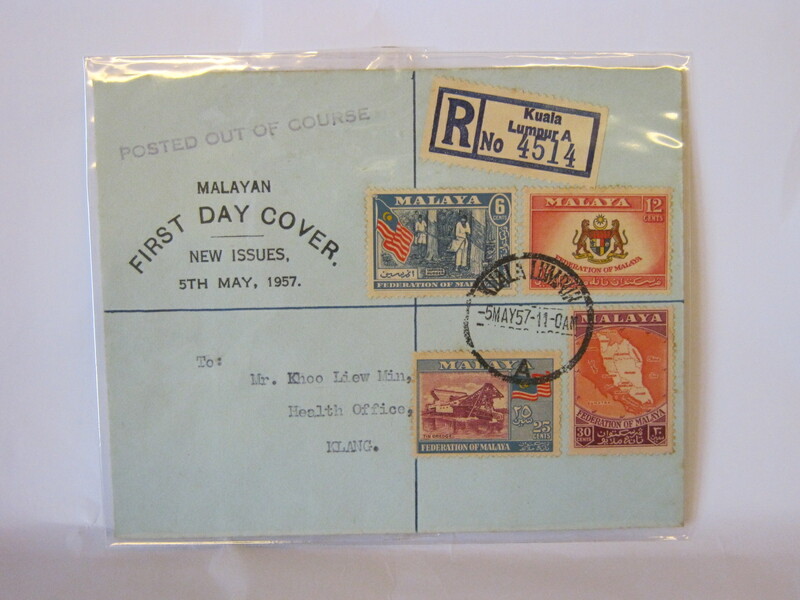 This FDC was cancelled in Penang on the first day of the resumption of PAID postage using the BMA overprinted stamps. 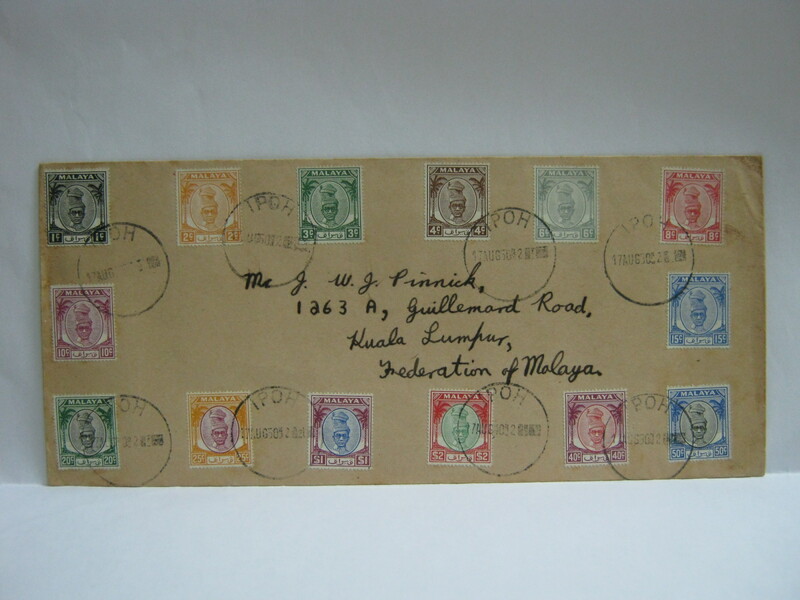 Initially postage was free when the British returned to Malaya and set up the British Military Administration. 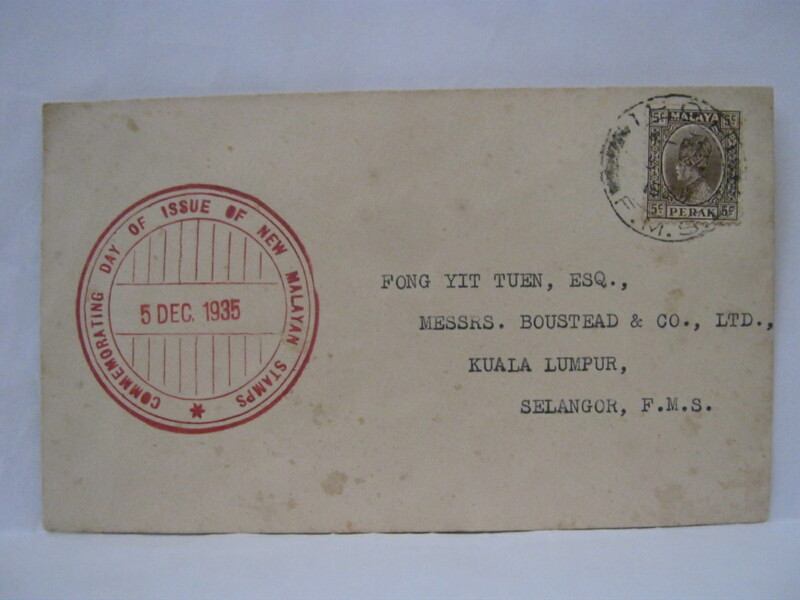 This FDC was cancelled in Kuala Lumpur and sent via registered mail with an A.V.2 marking to denote onward forwarding by air is required at the transit point. 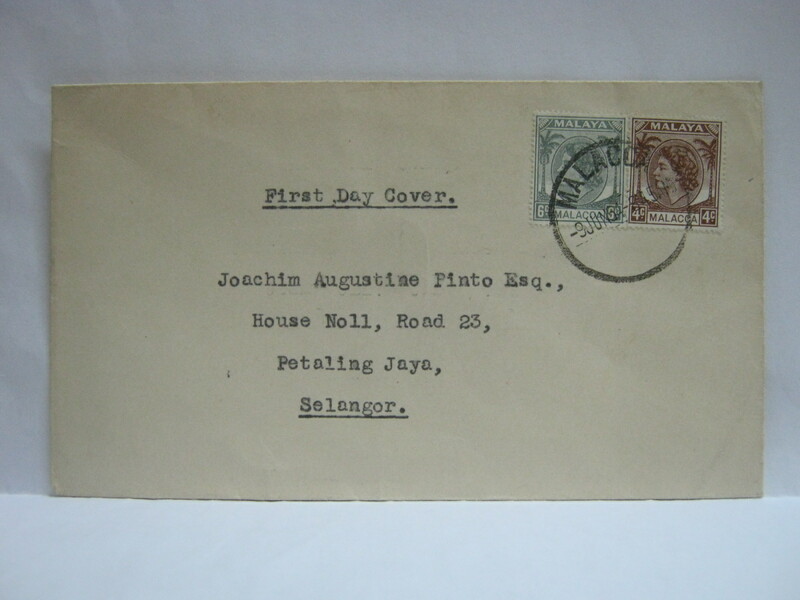 This FDC was cancelled in Johore Bahru. 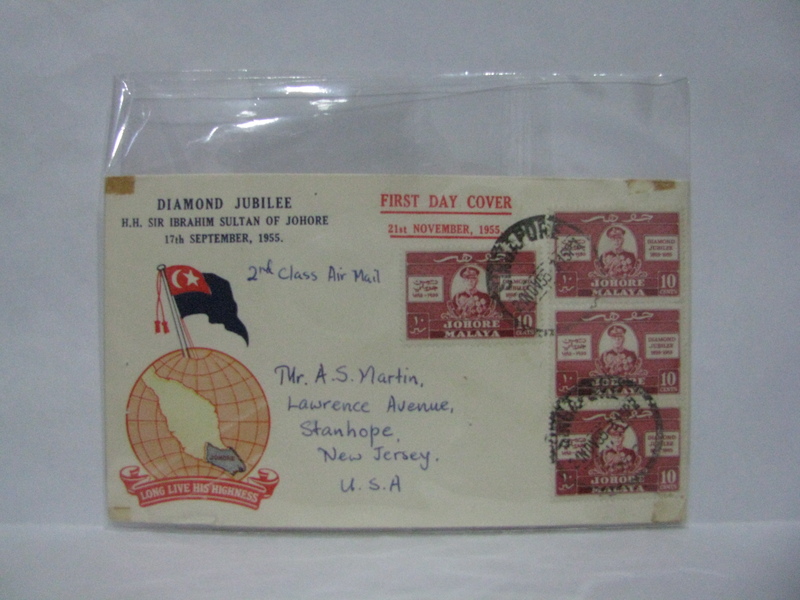 This FDC was cancelled with the U.N. Conference Singapore 29 mm diameter cancellation. There is a similar cancel with a 26 mm diameter. 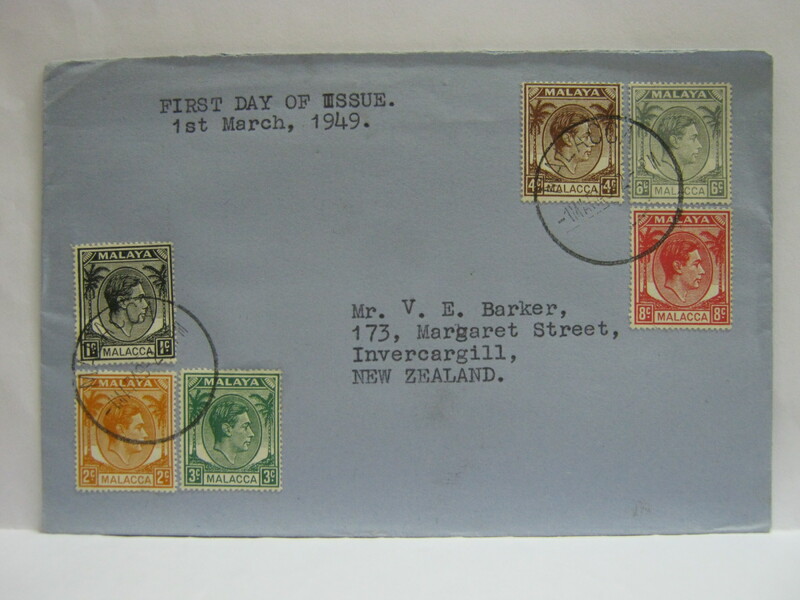 A post office was set up inside the Victoria Theatre and Memorial Hall where the UN Conferences were held from September to end of October 1949. The conferences were ILO Regional Conference (12 – 23 September 1949), FAO Pre-Conference Regional Meeting (26 September – 01 October 1949) and the 5th Session of ECAFE (20 – 29 October 1949). 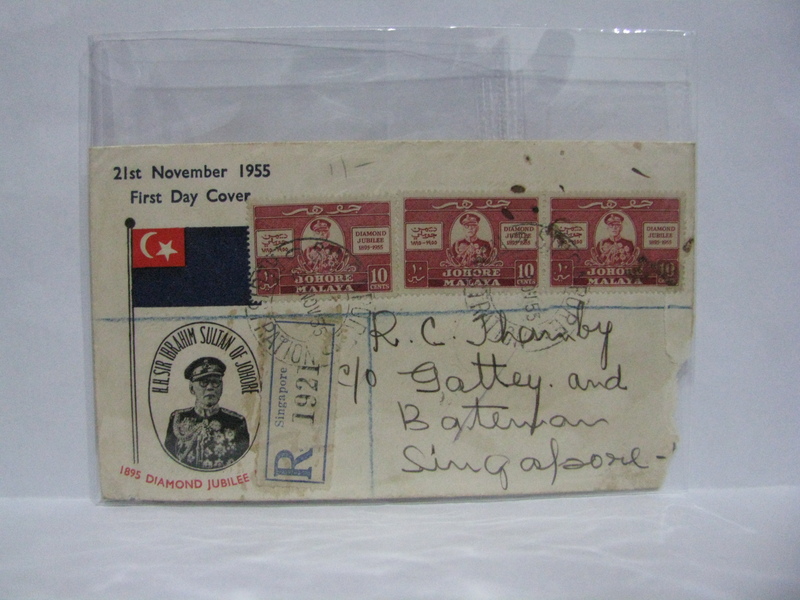 The back is cancelled with the United Nations Conferences Singapore September – October 1949 cachet. 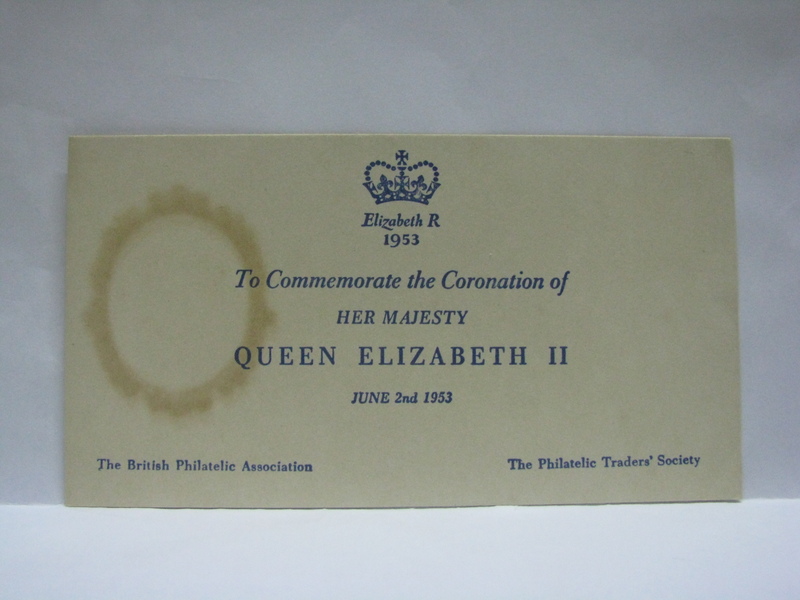 The cachet is used on the mails during the conference. 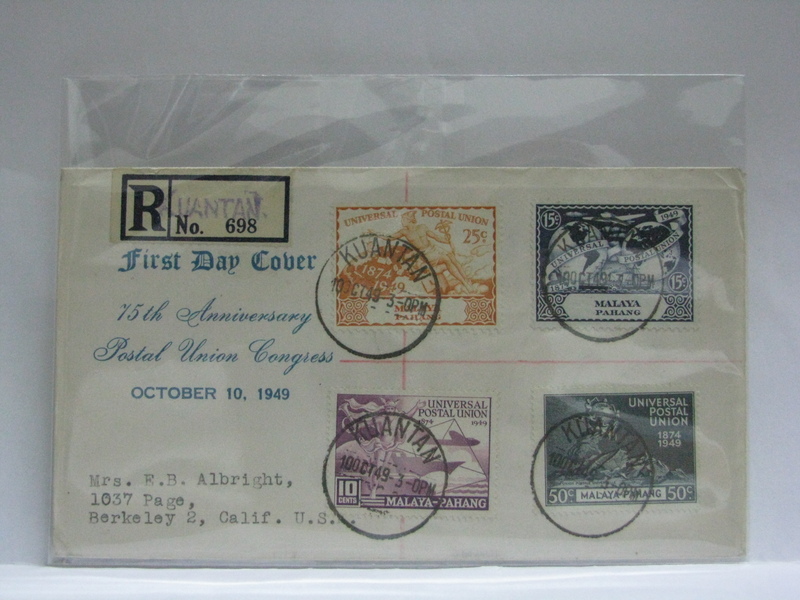 The 10 October 1949 date is hard to obtain as it coincides with the first day of issue of the UPU series. 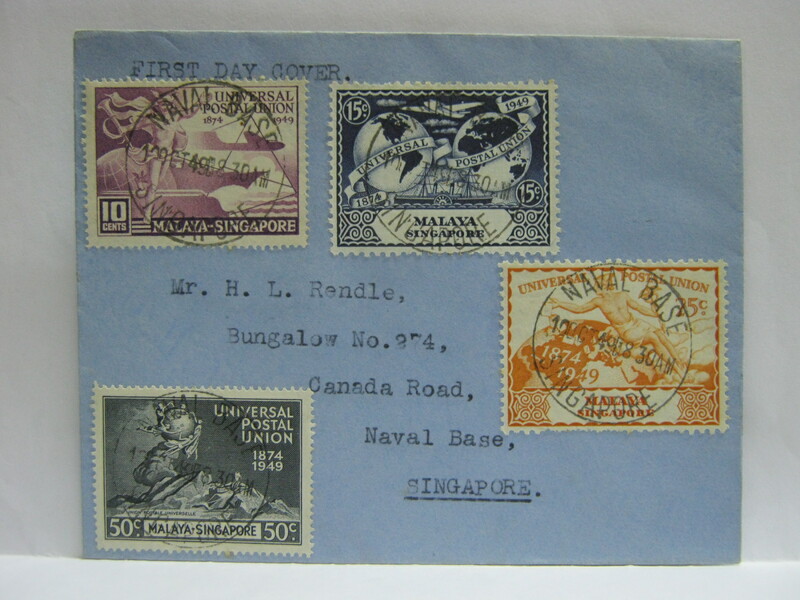 This FDC was cancelled in Naval Base Singapore. 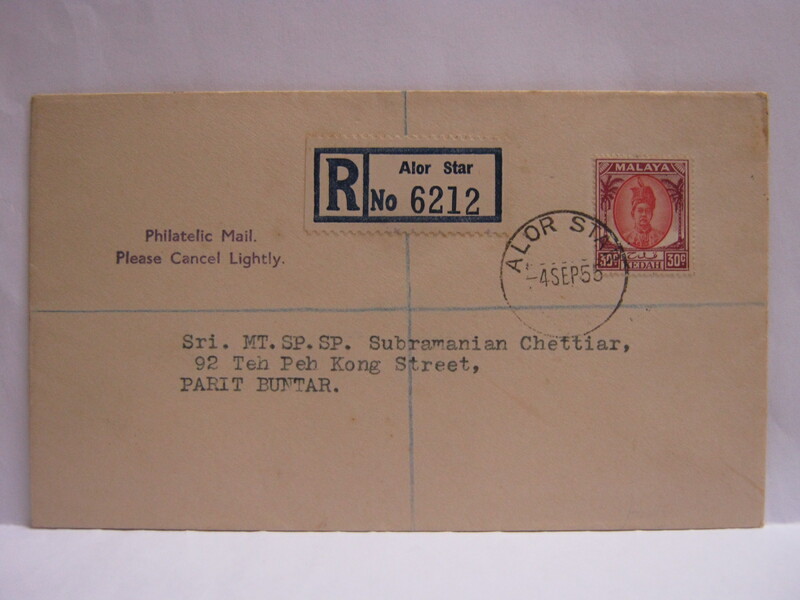 This FDC was cancelled in Alor Star with the low value definitive stamps. 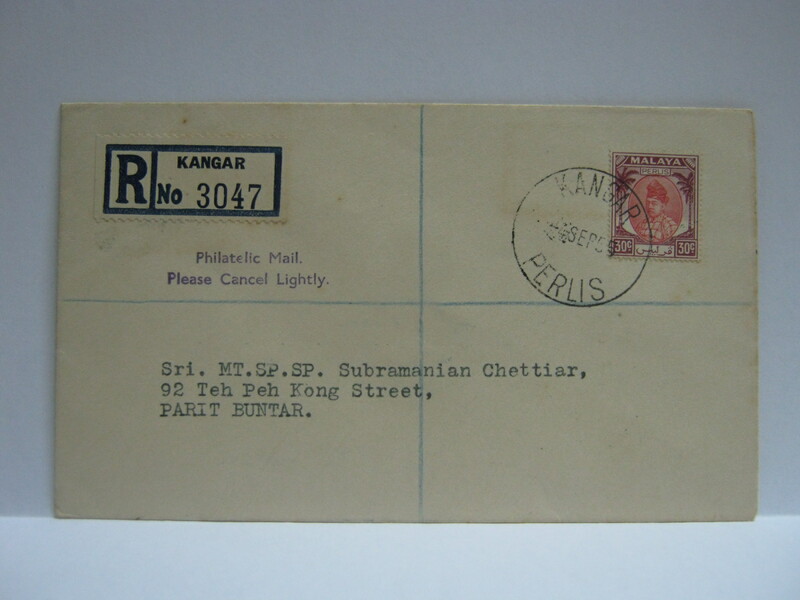 This FDC was cancelled in Kangar and affixed with the definitive stamps issued on 01 September 1952. 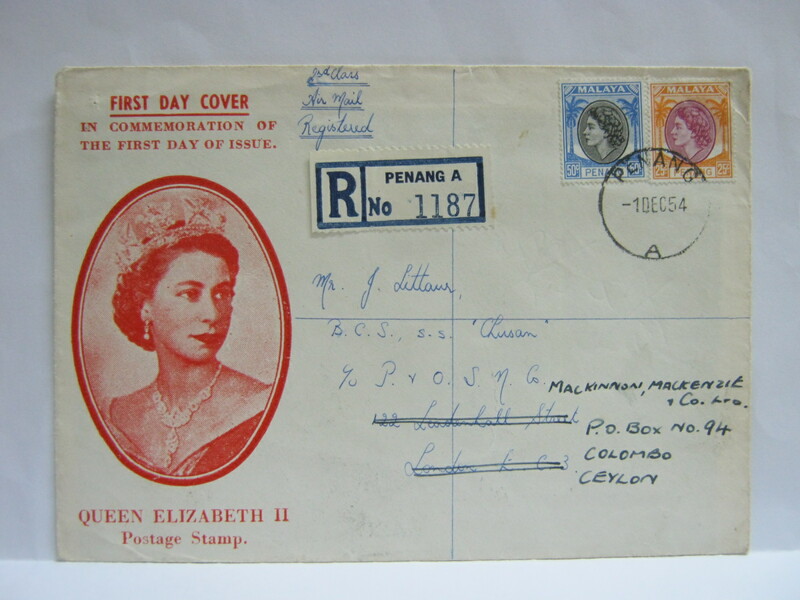 It is pretty hard to get a full set of definitives cancelled on the day of issue especially in Kangar. This FDC was cancelled in Alor Star. 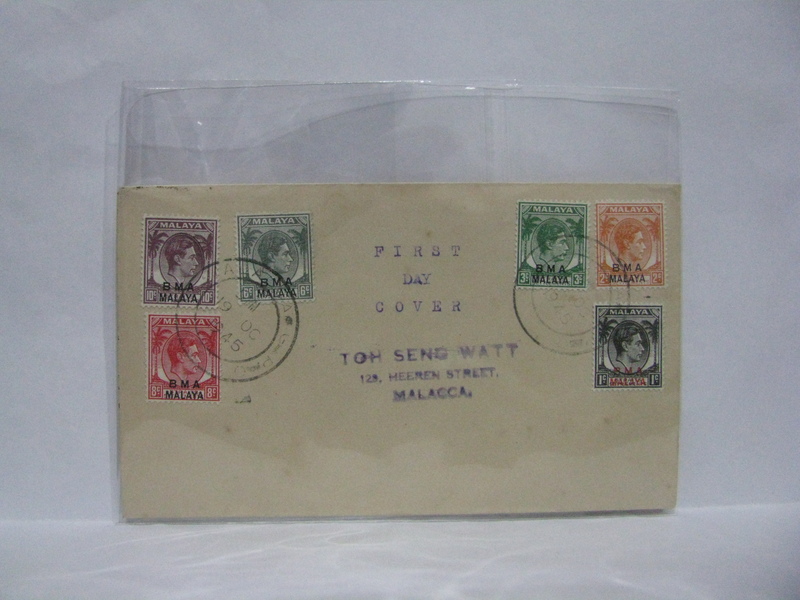 This FDC was cancelled in Penang. 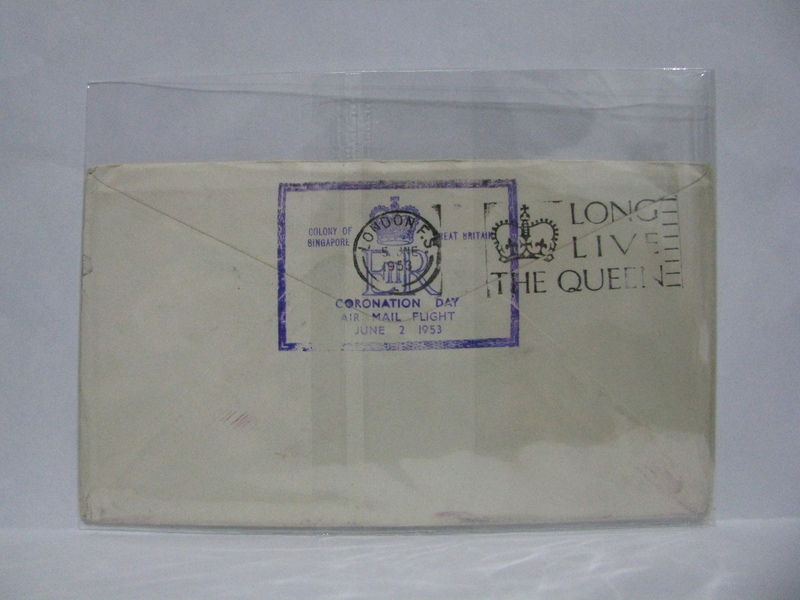 There is also an insert for this type of envelope. 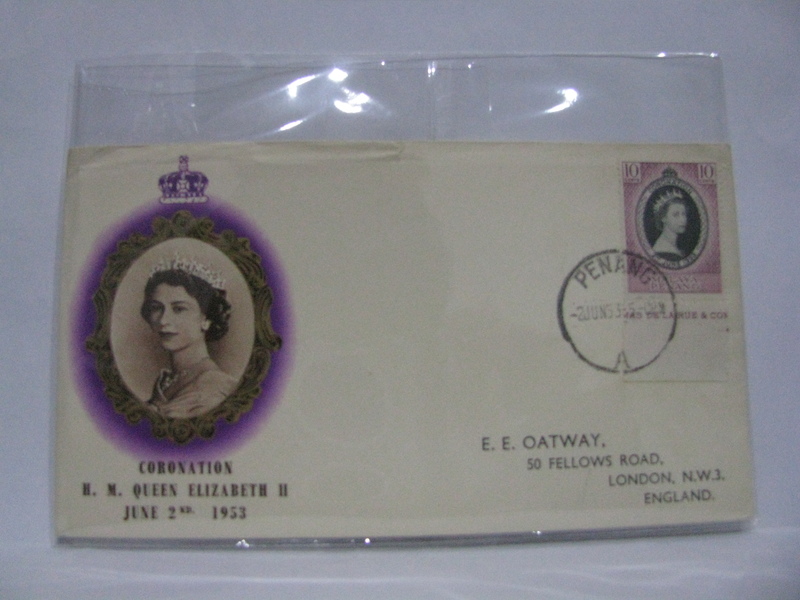 The complete cover includes an insert such as the one below. This insert is pretty hard to come by. Here is another version of the insert. Here is the third type of insert. This is the hardest to find. 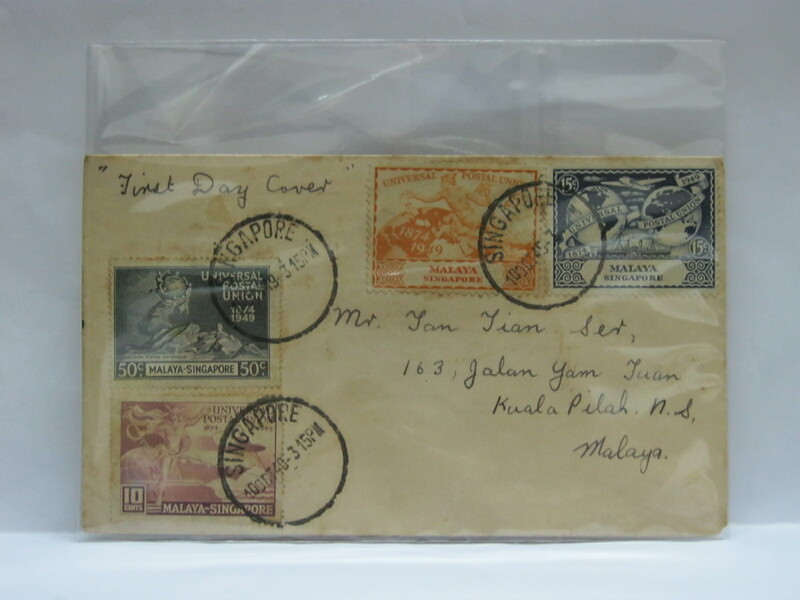 These 2 FDCs made up a full set of 12 states’ stamps on cover cancelled in Kuala Lumpur and sent via registered mail. 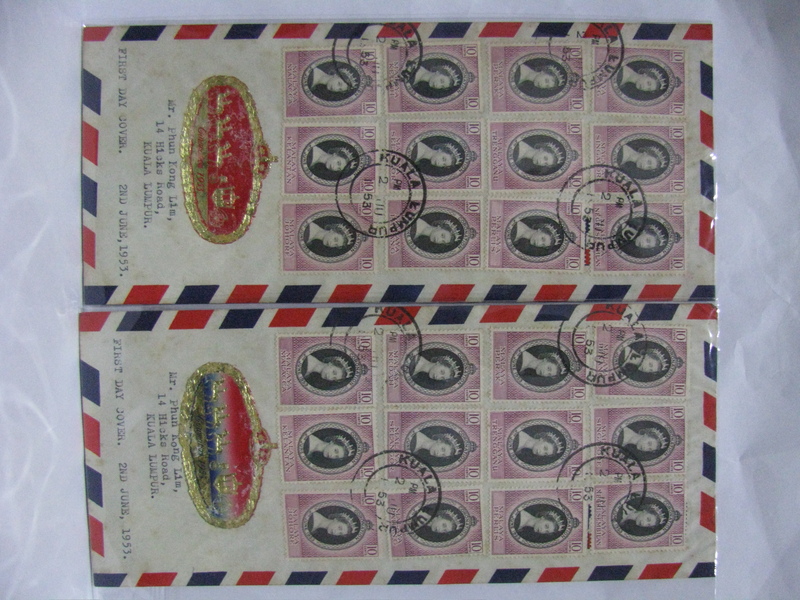 These two FDCs have the same 12 states’ stamps on cover cancelled in Kuala Lumpur and sent via normal mail. 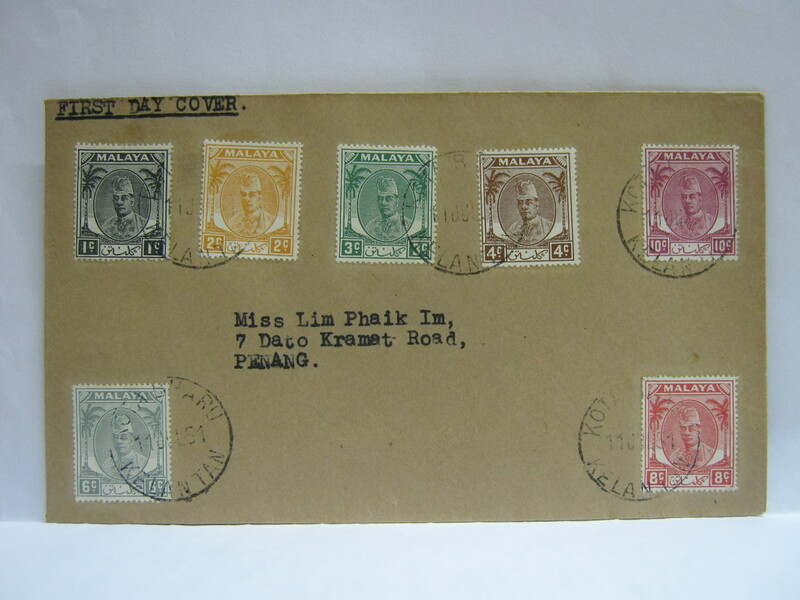 This FDC has a full set of 12 states’ stamps on cover cancelled in Singapore. 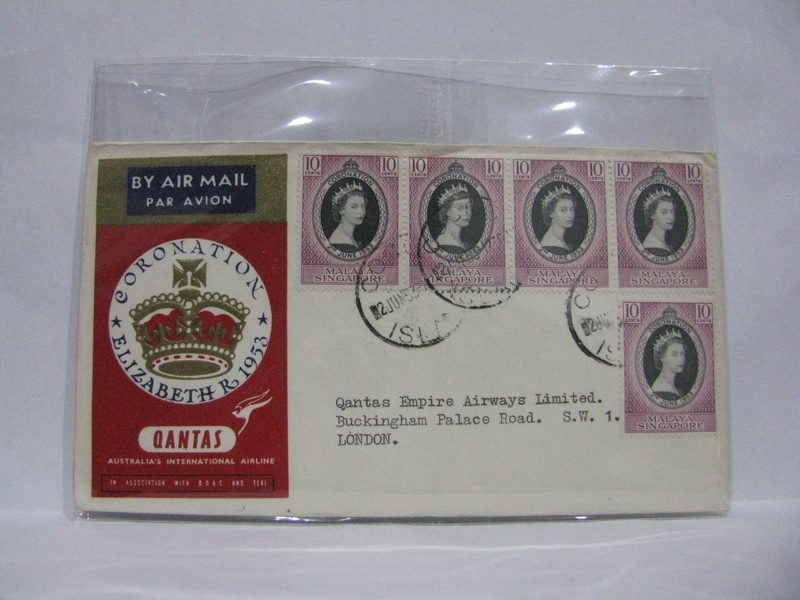 It is from the QANTAS collection. 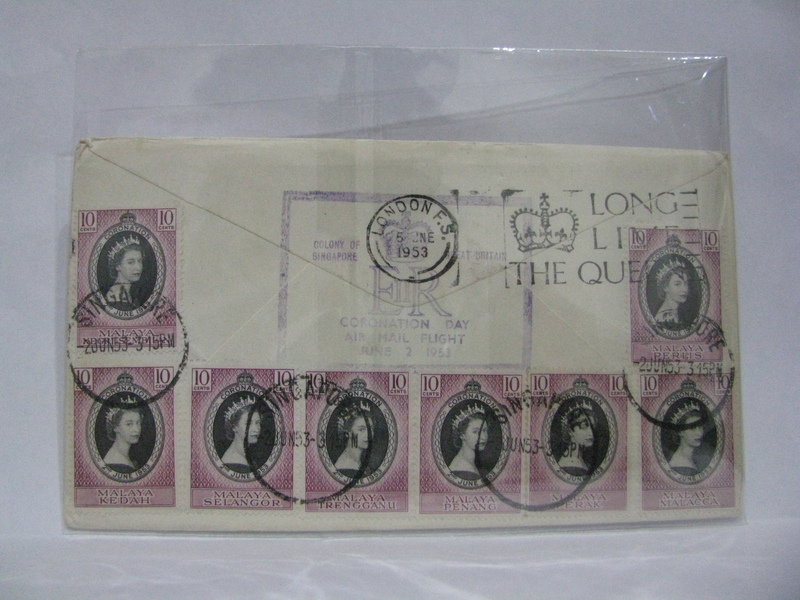 At the back is a London cancellation. 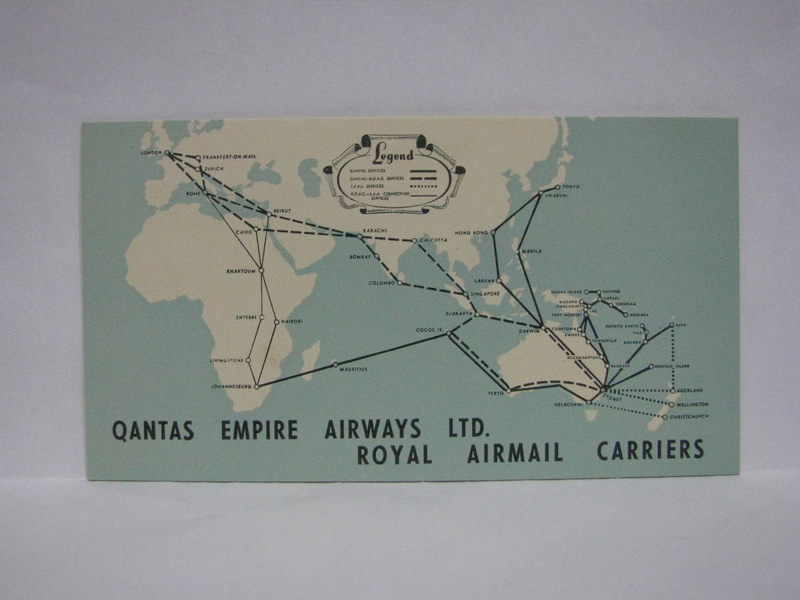 All QANTAS FDCs include a flight route card. Some dealers took out the card to sell separately. 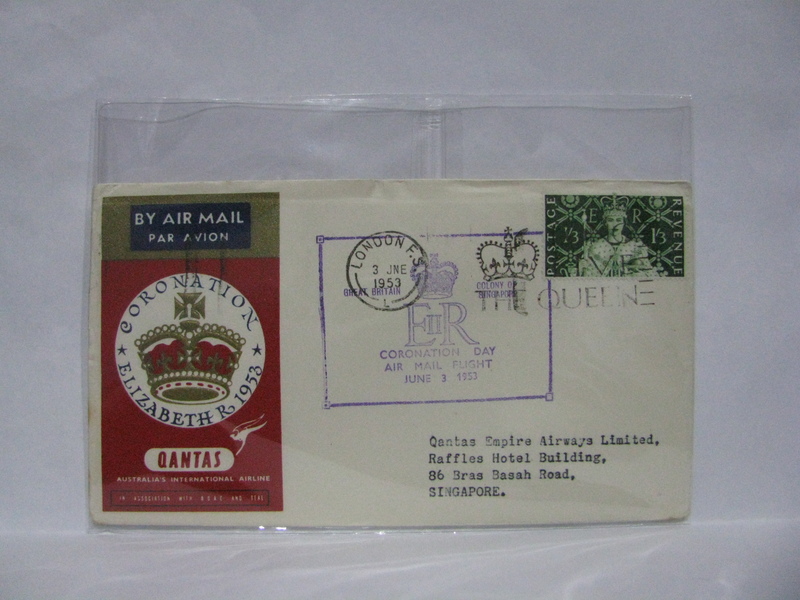 This QANTAS FDC was cancelled in Singapore. 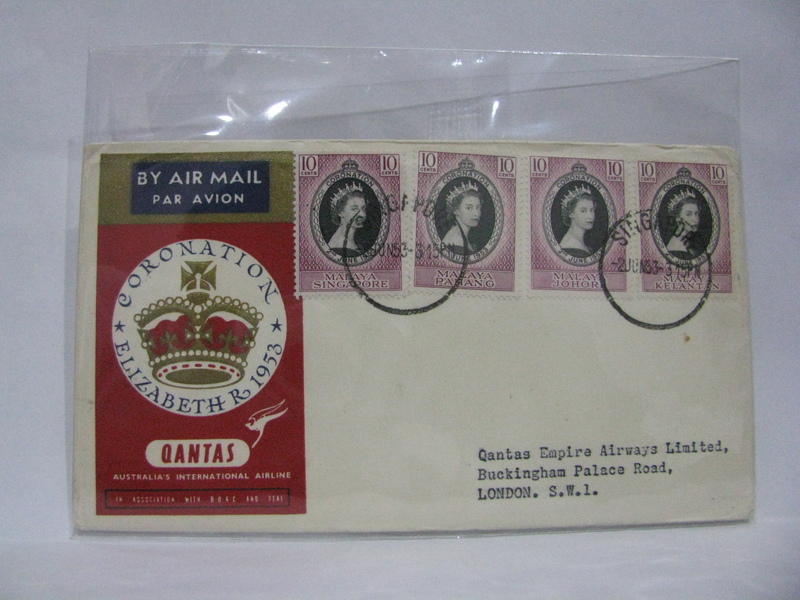 At the back is a London cancellation. 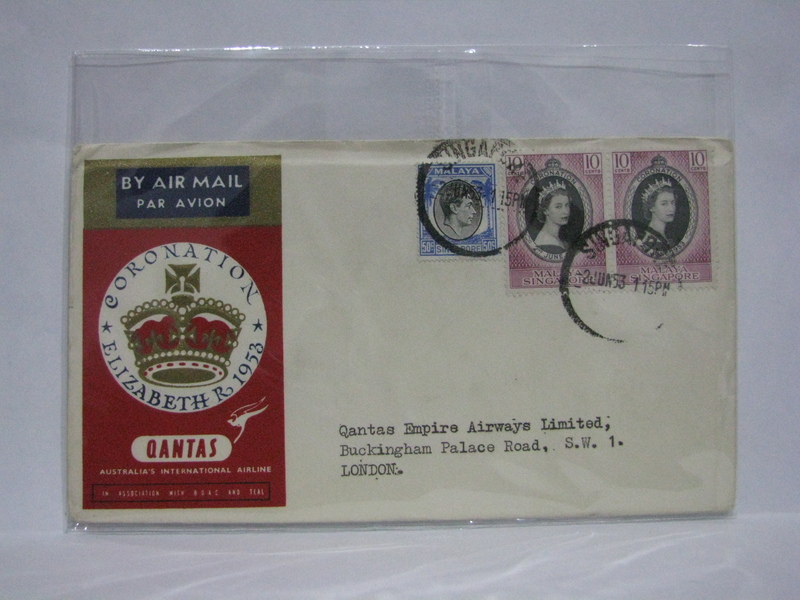 The QANTAS FDC actually comprise of a set of FDC from the territories to UK and a cover from UK back to the territory. 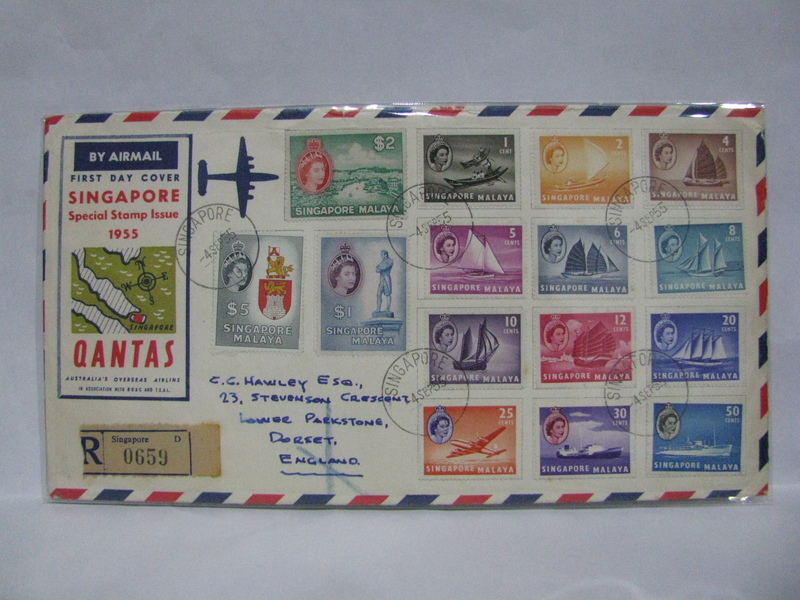 Here is the cover from UK to Singapore with back cancellations from Singapore. The stamp set is incomplete. 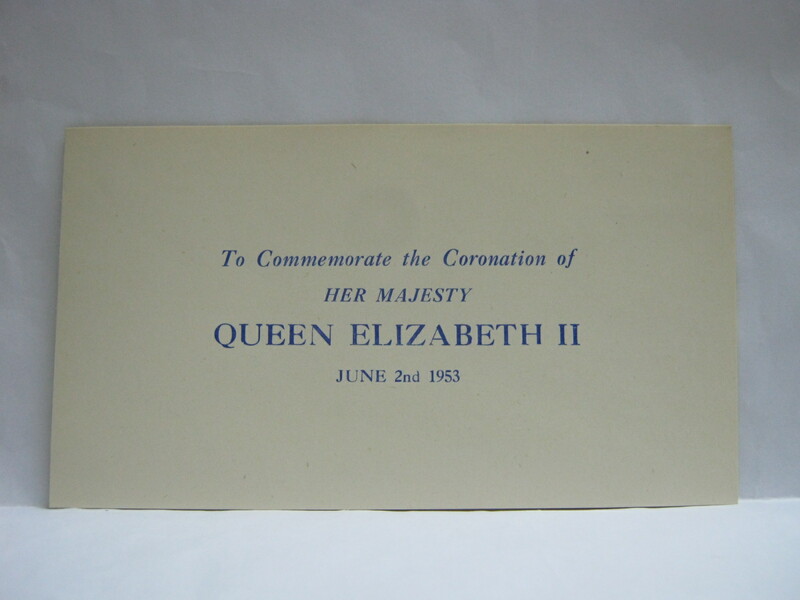 It is however cancelled on the first day of issue on 03 June 1953. Interestingly, did you know that Cocos Island was administered by Singapore (from Straits Settlements to Malaya) before it was handed over to Australia on 23 November 1955? Here is the FDC cancelled in Cocos Island with the back cancelled in London. Today Cocos Island is known as Cocos (Keeling) Island. 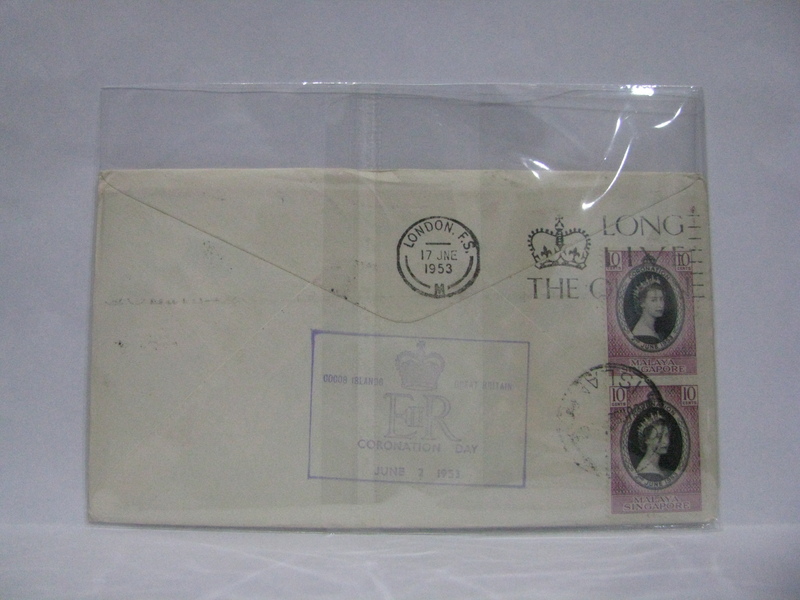 This is the return cover from UK back to the territory. 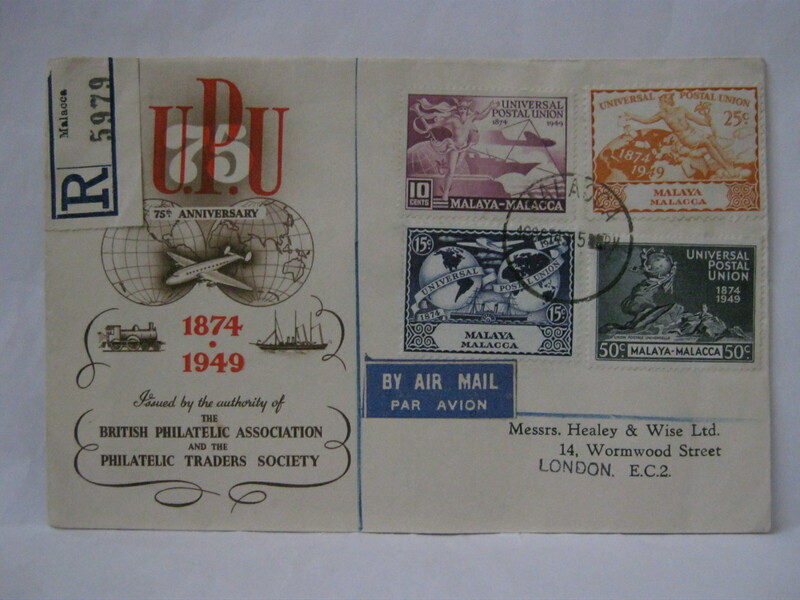 Here is the cover from UK to Cocos Island with back cancellations from Singapore and Cocos Island. 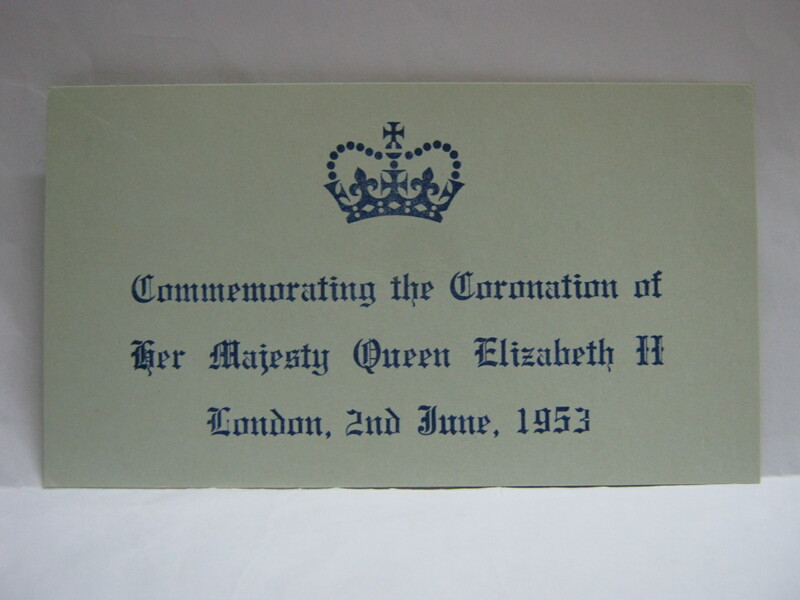 It is cancelled on the first day of issue on 03 June 1953. This is an item of interest. 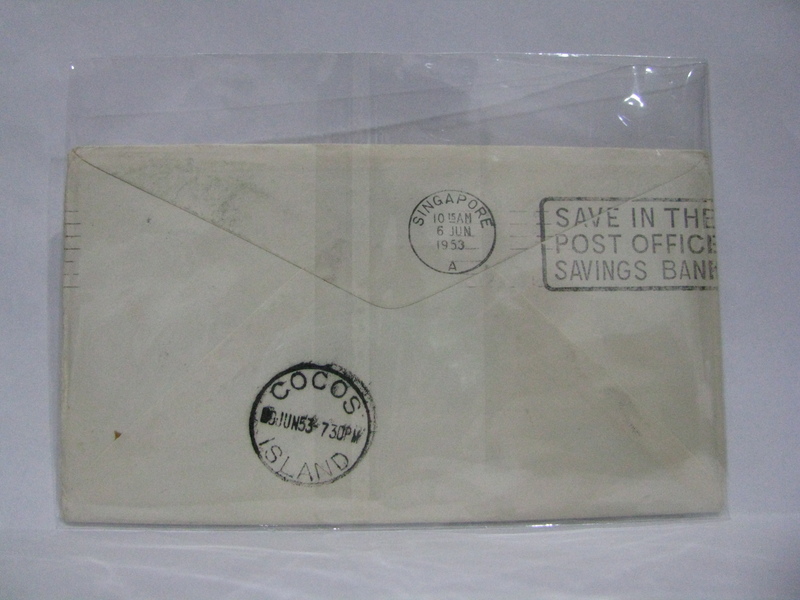 This is a Cocos (Keeling) Island FDC commemorating the 25th Anniversary of Australian Administration. 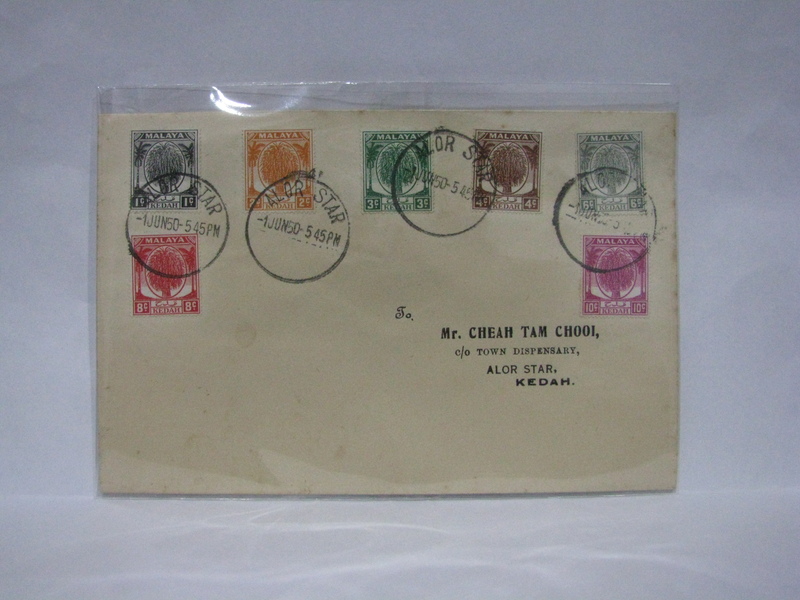 The setenant stamps shows the history of the various administrators of Cocos (Keeling) Island. 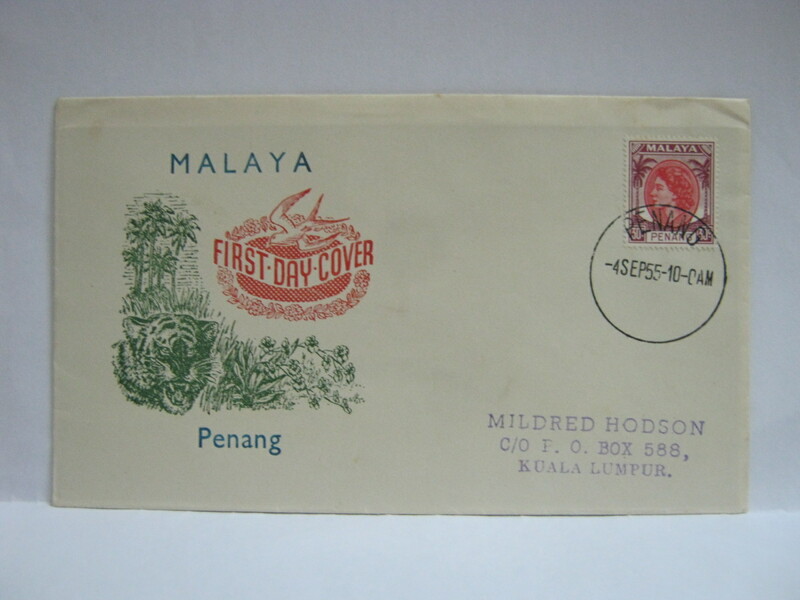 This FDC was cancelled in Penang and was sent via registered mail. 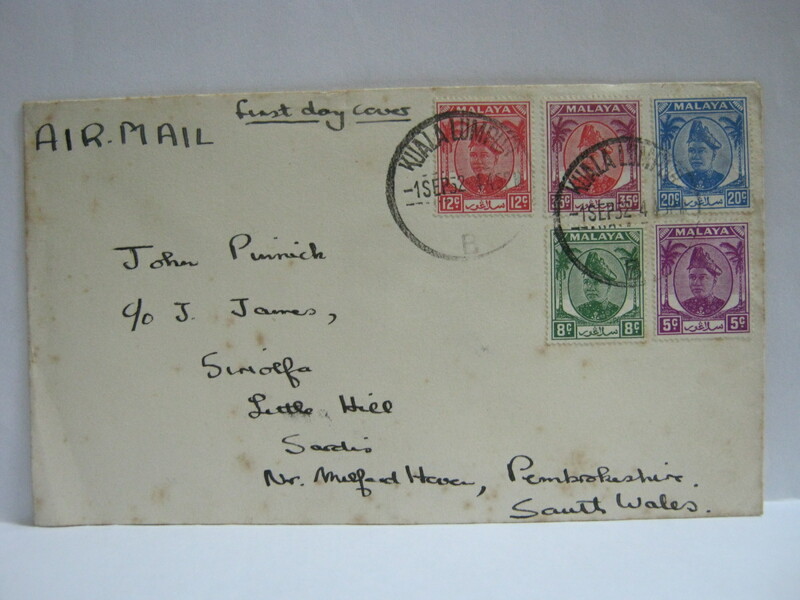 This FDC was cancelled in Singapore and was sent via registered mail. 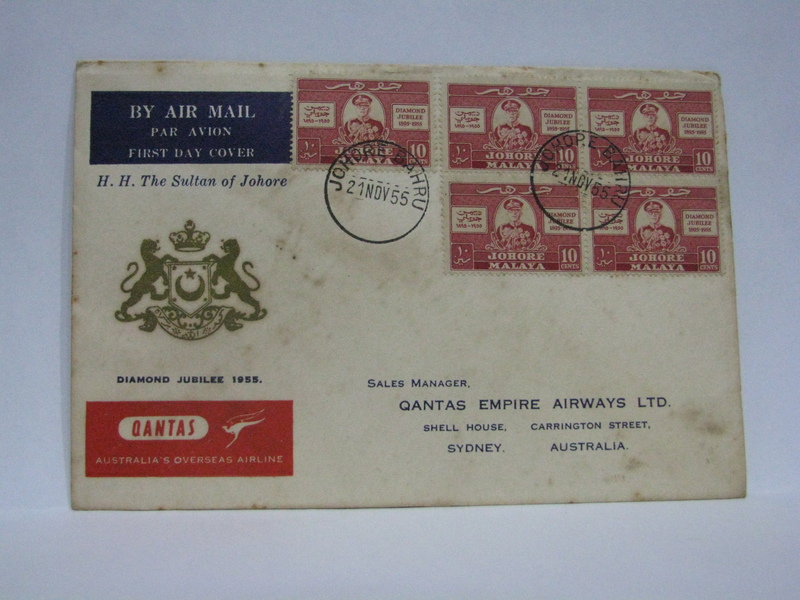 This is the Qantas version. 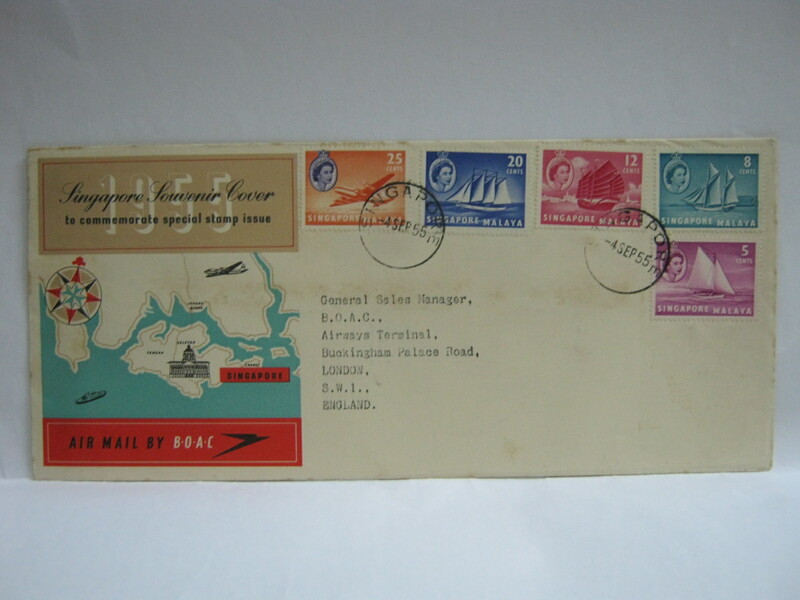 This FDC was cancelled in Singapore and sent via normal mail. 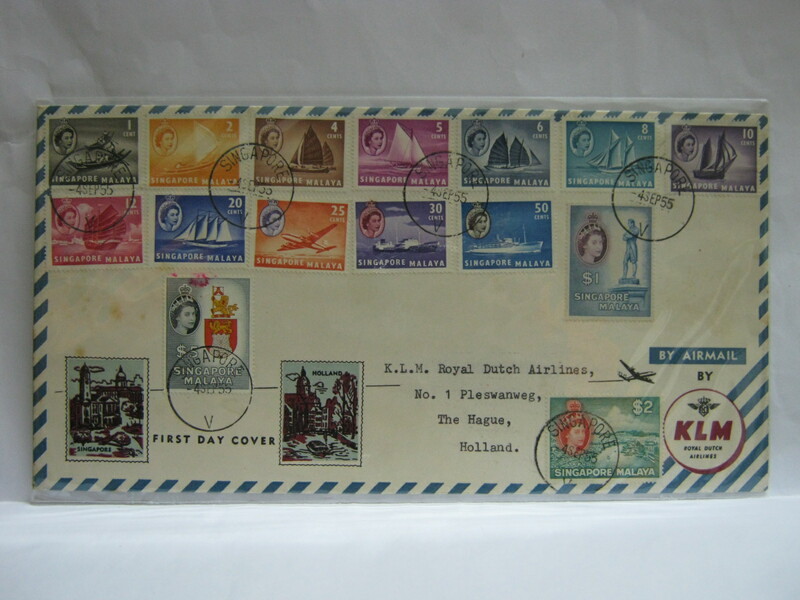 This is the KLM version. 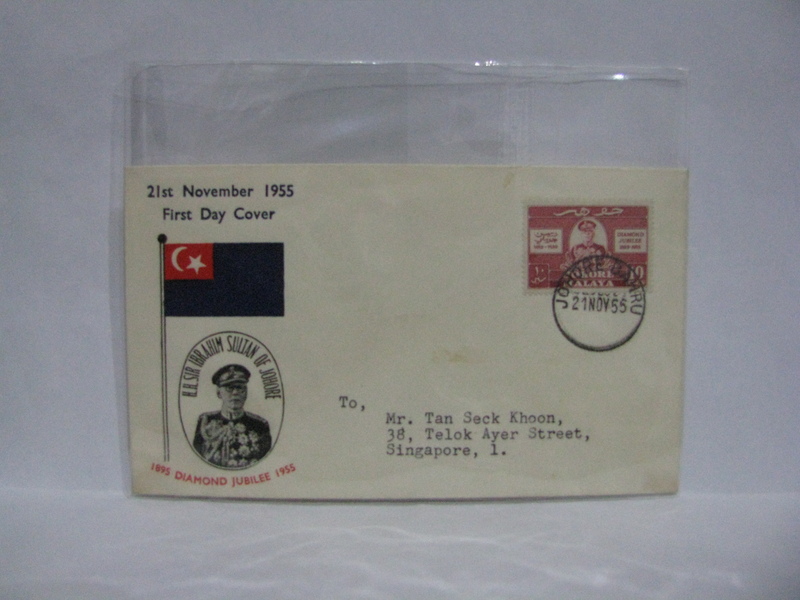 This FDC was cancelled in Singapore and sent via normal mail. 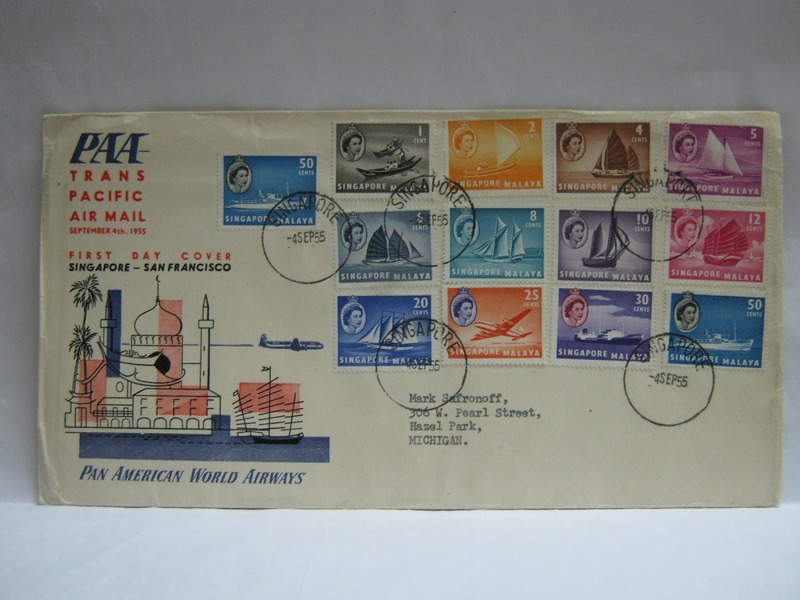 This is the Pan American World Airways version. 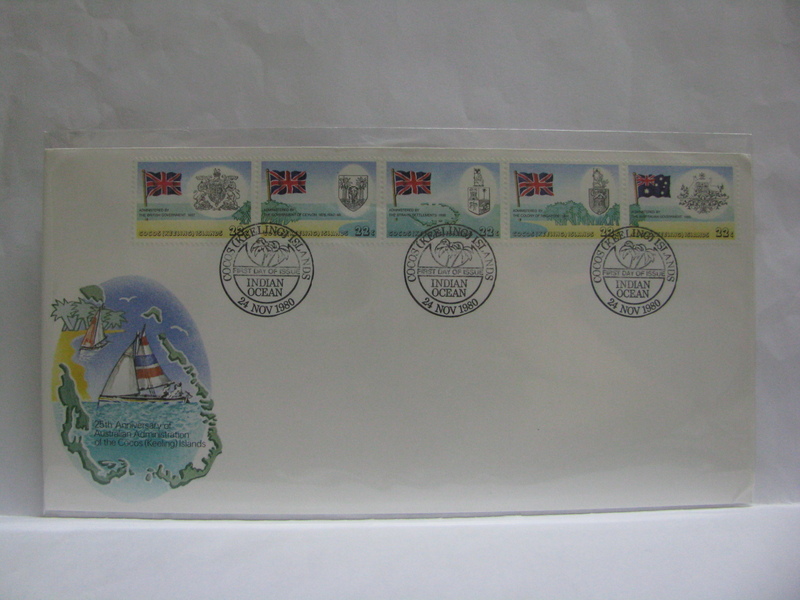 The stamps are only the complete set of low value stamps in the series. 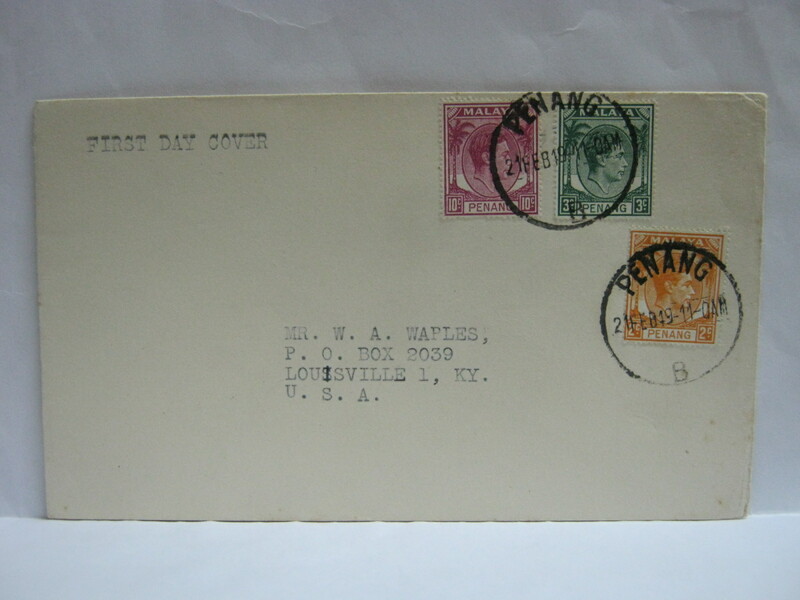 This FDC was cancelled in Singapore and sent via normal mail. 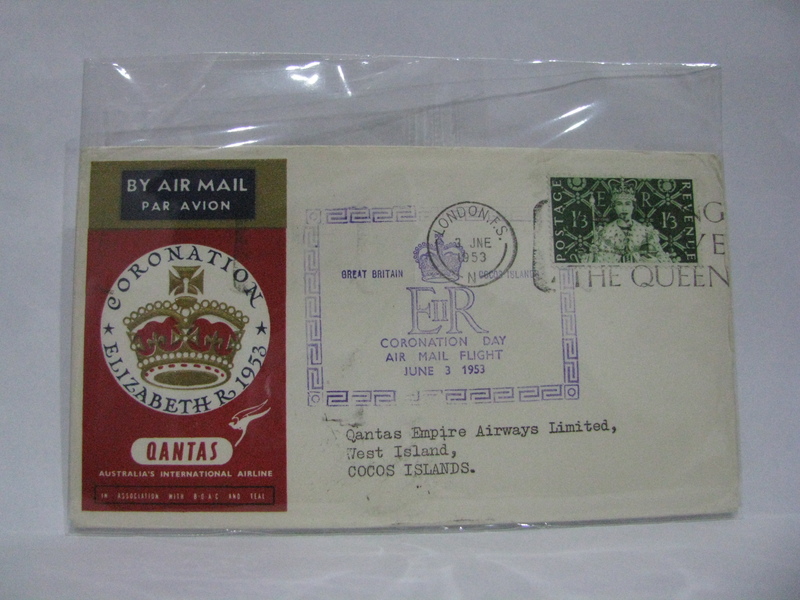 This is the BOAC version. 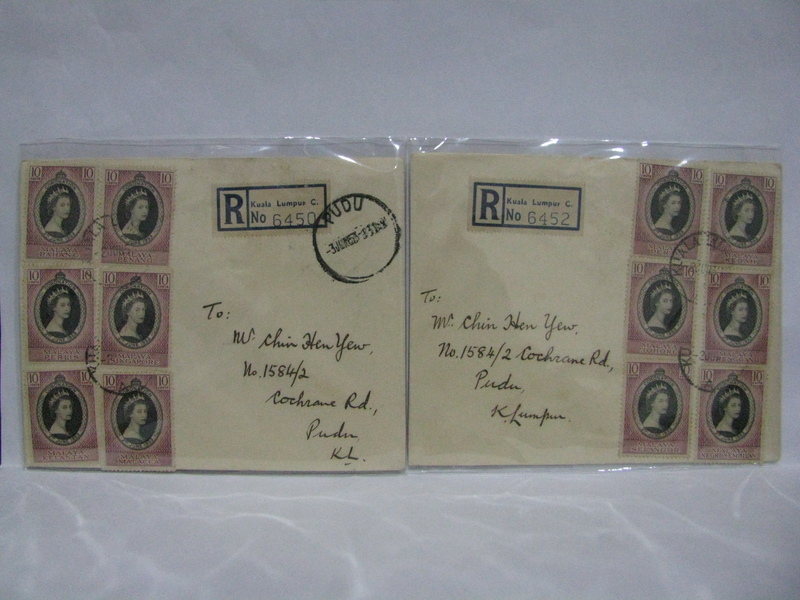 However only a few stamps from the series were selected. 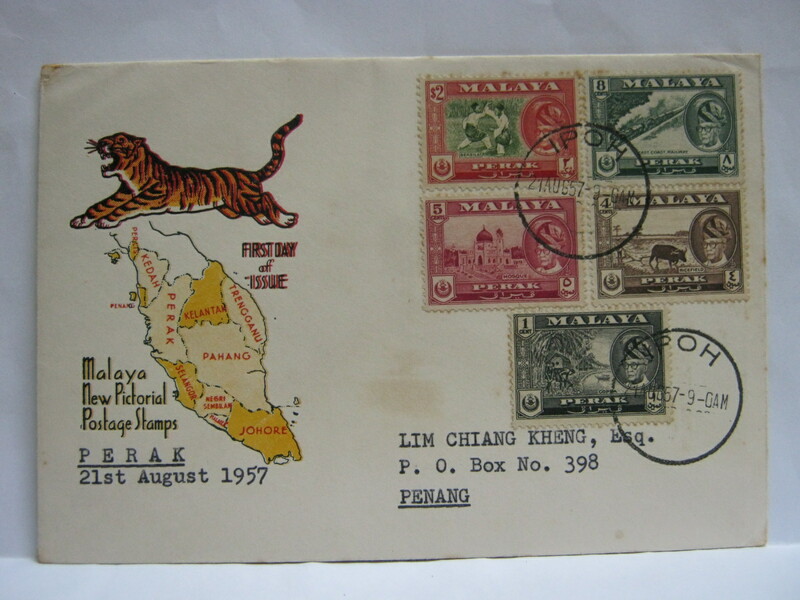 This FDC was cancelled in Kangar and was sent via registered mail. 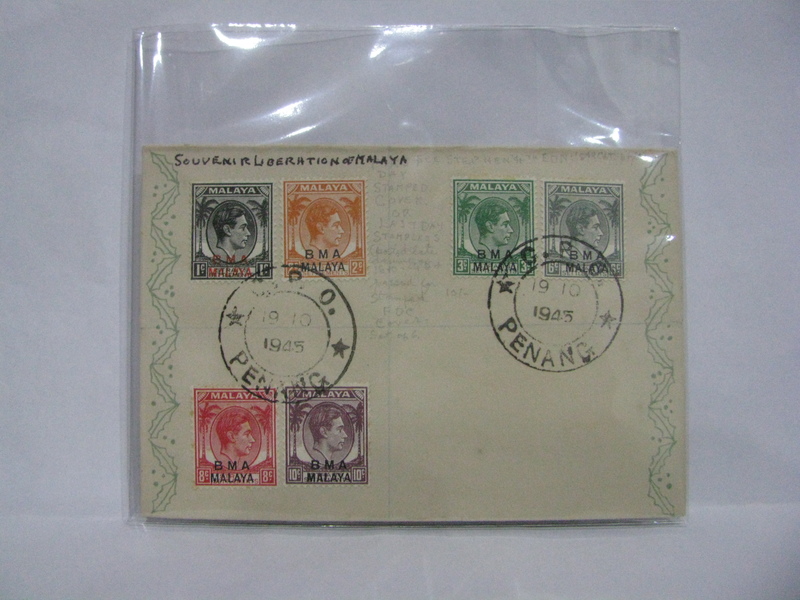 This FDC was cancelled in Alor Setar and was sent via registered mail. 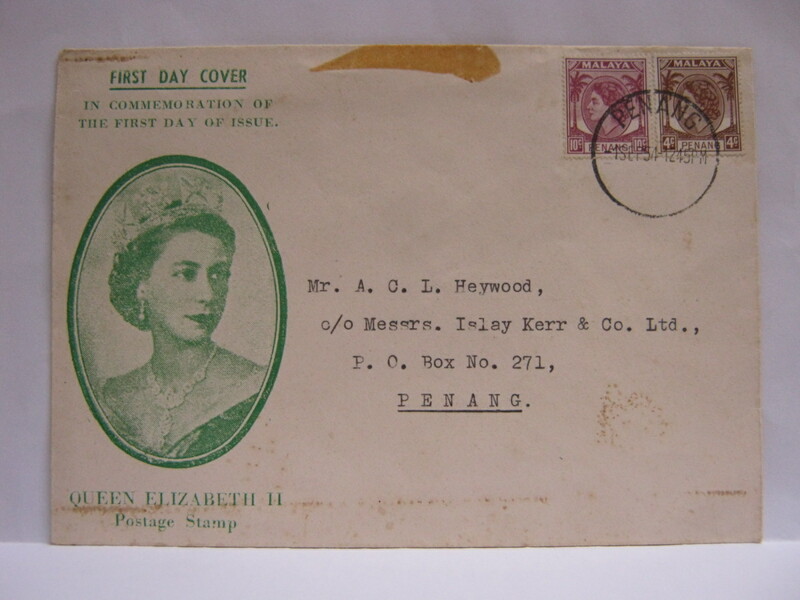 This FDC was cancelled in Penang and was sent via normal mail. 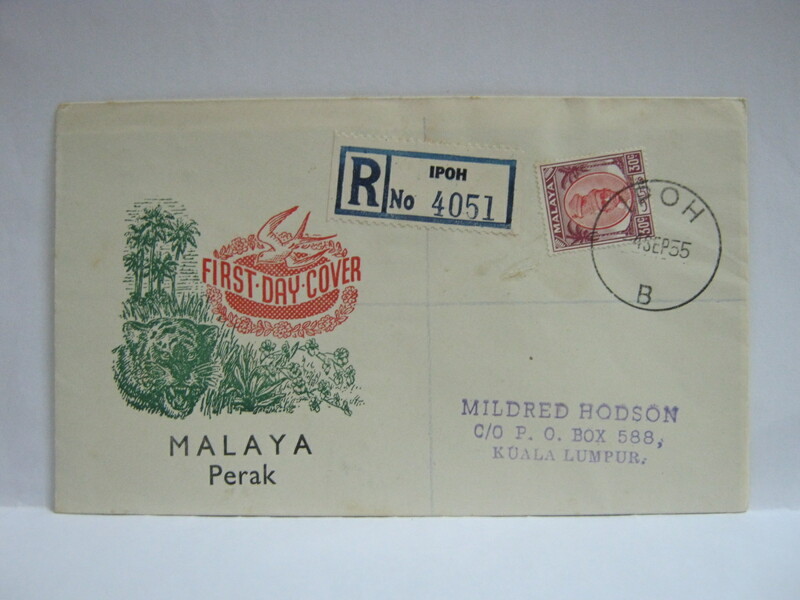 This FDC was cancelled in Ipoh and was sent via registered mail. 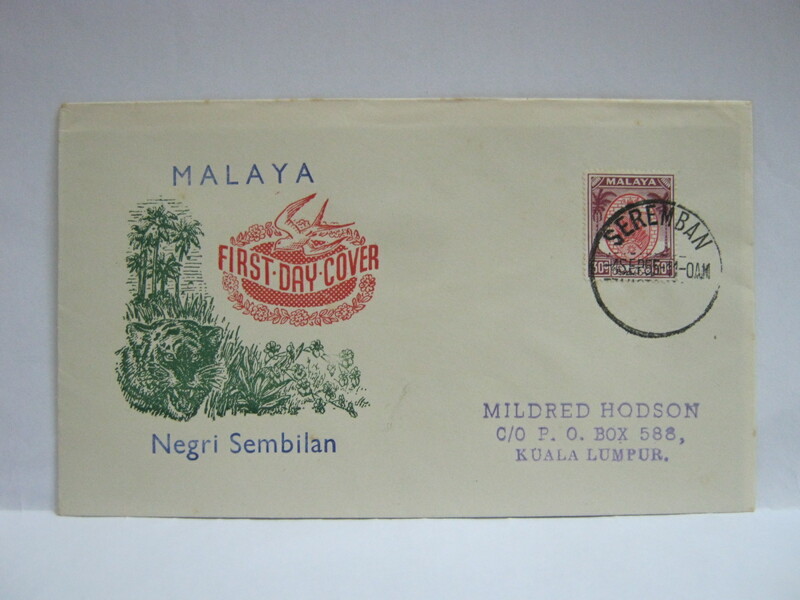 This FDC was cancelled in Seremban and was sent via normal mail. 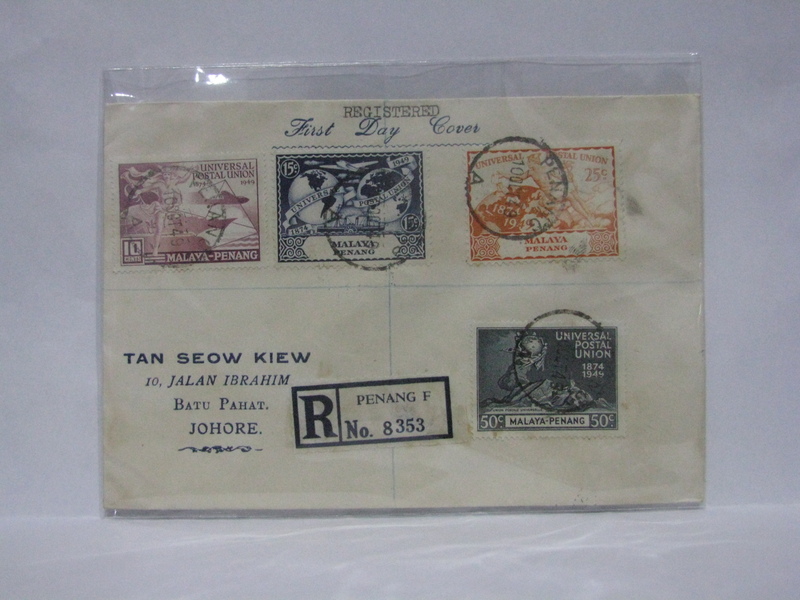 This FDC was cancelled in Johore Bahru and was sent via registered mail. 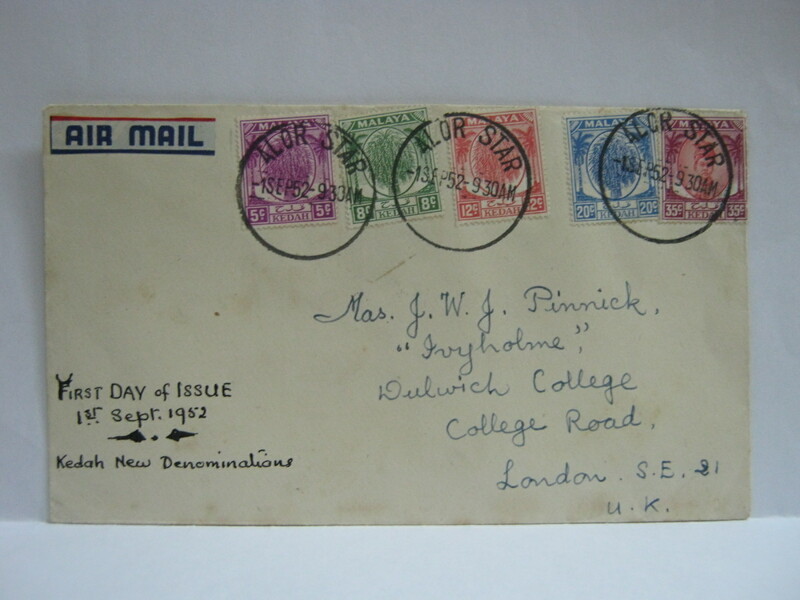 The date of issue was moved to 21 November 1955. 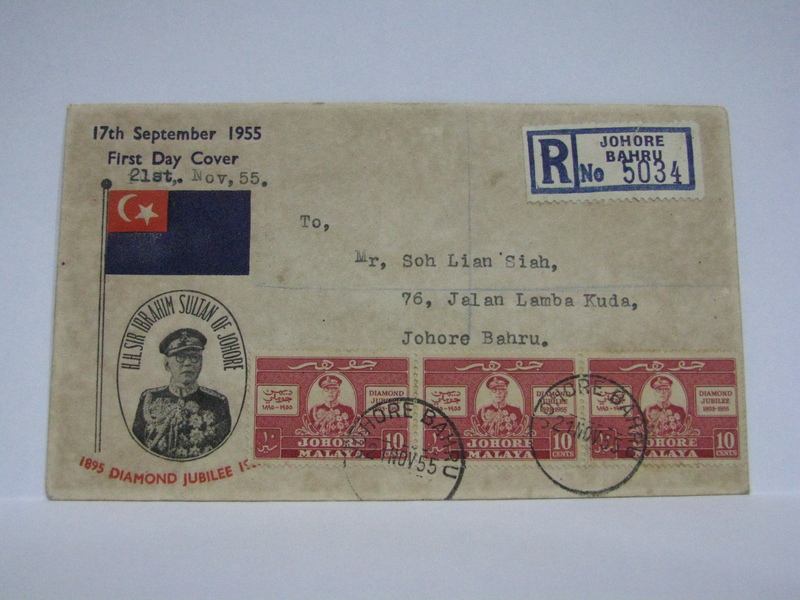 Here is the FDC cancelled in Johore Bahru on the re-issued cover with the correct date. 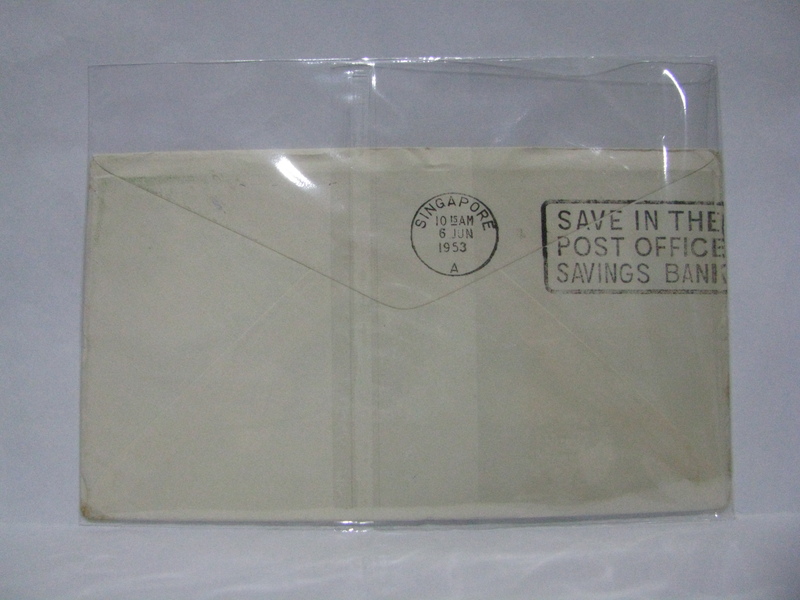 Here is the re-issued envelope (with the revised date of issue) cancelled in Singapore and sent as registered mail. 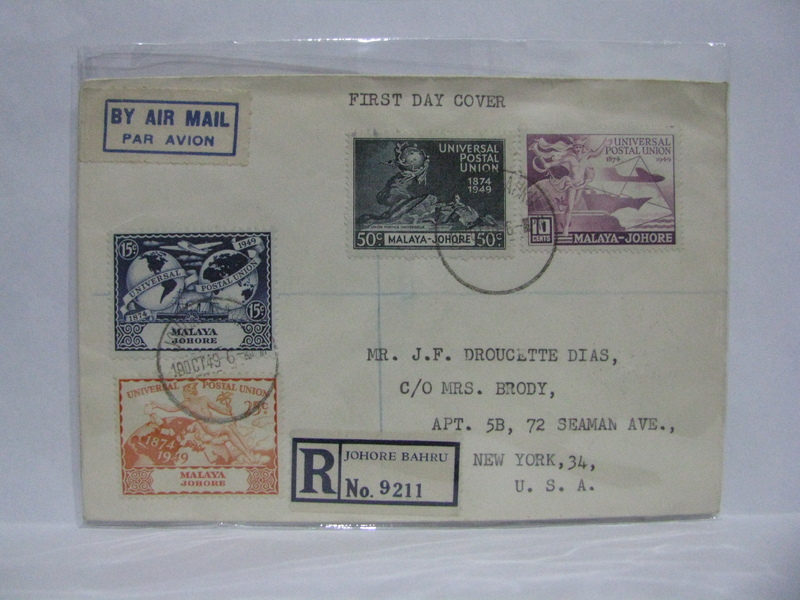 This cover is cancelled in Singapore and sent as 2nd Class Airmail. 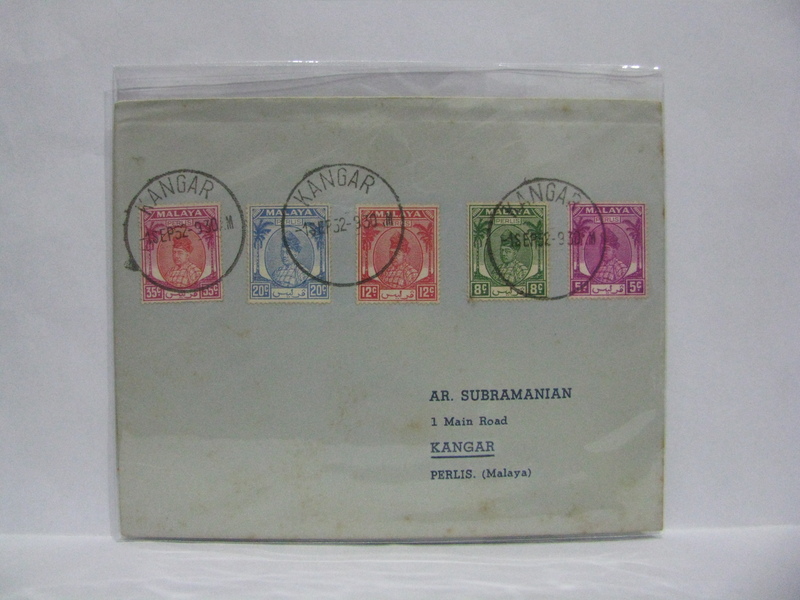 The cover’s date of issue is still 17 September 1955. 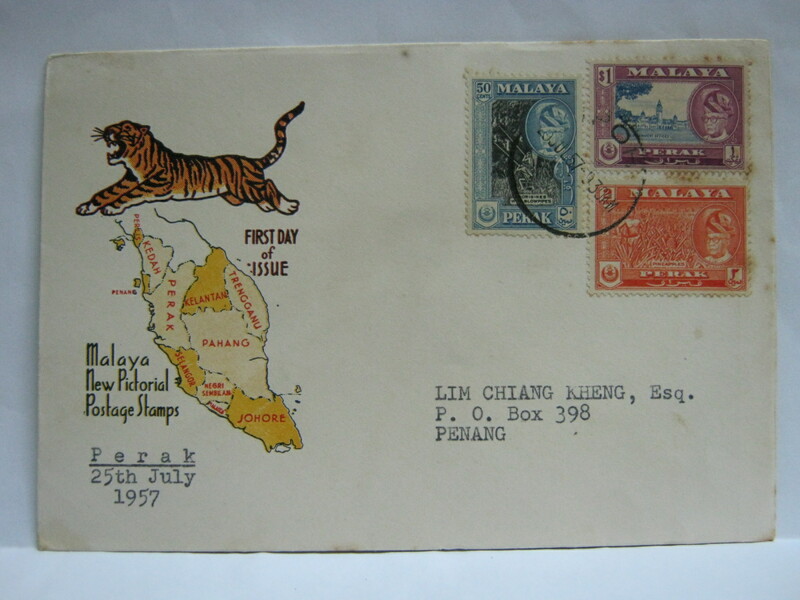 This FDC was Posted Out of Course on a registered mail in Kuala Lumpur. Posted Out of Course usually meant that a registered letter was just dropped into the mail box without handing over to the post office for registration. 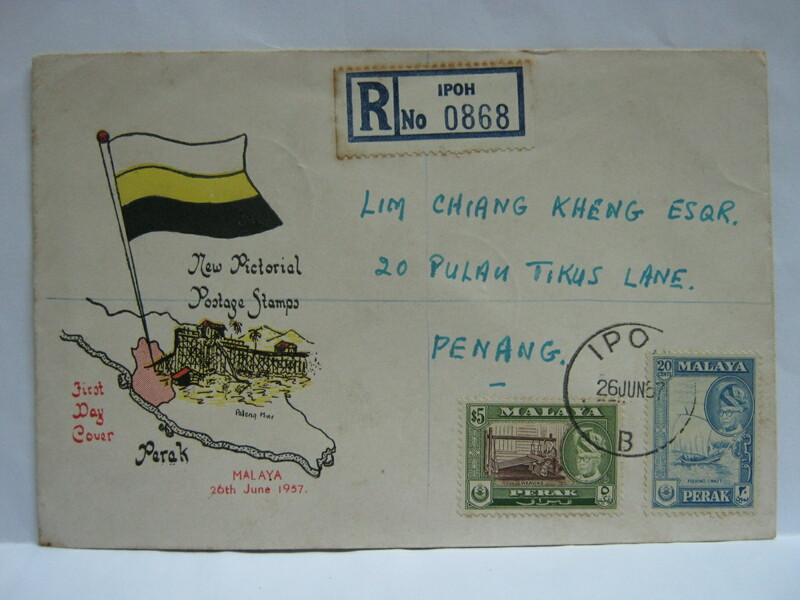 This FDC was cancelled in Ipoh and sent via registered mail. I would be interested in FDC BMA Singapore. Thank you! 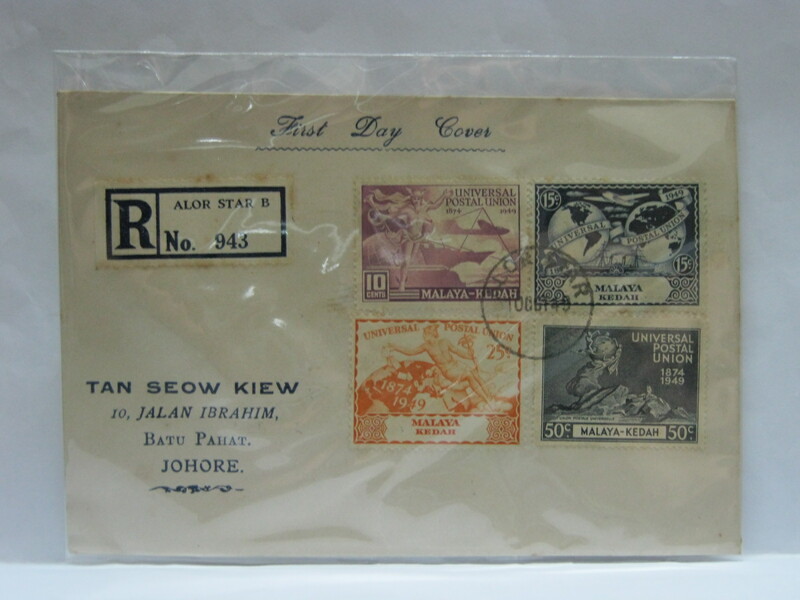 The Malaya series is a very extensive series and quite a large collection of stamps. I do not specialise in stamps. 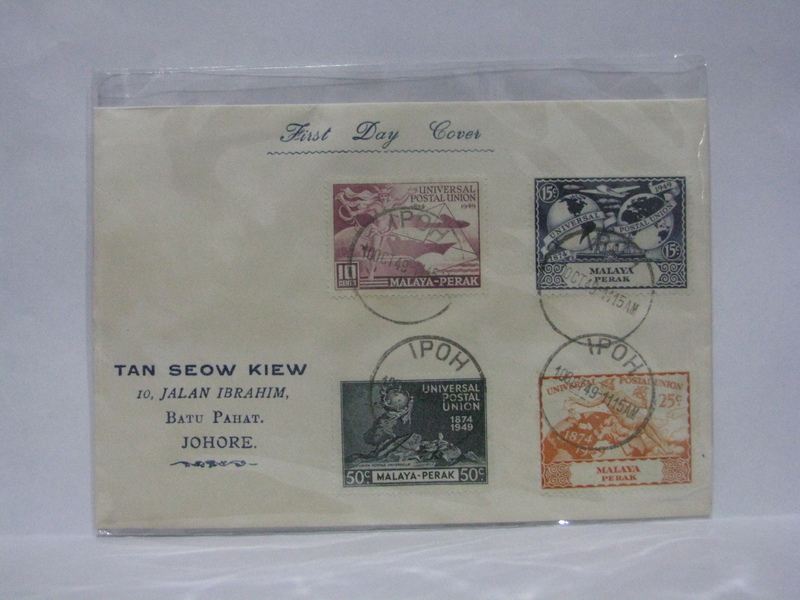 The best is to get a copy of the International Stamp and Coin (ISC) Standard Stamp Catalogue of Malaysia – Singapore – Brunei. The 30th Edition is slated to be publish in September 2015. Try and get that copy since it will be the final edition to be published.